Q: How do you feel after having won both the KSL and ASL? A: I had barely any expectations when the league first began. My left arm wasn't well. I entered the league with the thought of merely playing up to par, but thankfully results went my way and I was able to go all the way because because my injuries got better over time. Q: What was the hardest moment for you? A: When I was preparing for the round of 16, the pain in my left arm was getting worse. It hurt every time I pressed the keyboard, and it was a nightmare to deal with. After seeking medical help and managing the pain, it got a lot better. Q: Does it hurt even now? A: I'm currently taking pain medications, and I also had injections to deal with the injuries. It's okay. I'm holding on. Q: How long do you think you can keep participating in tournaments in such a condition? A: I will do everything in my power to keep participating. I will make sure to enter the next tournament as the defending champion, and I will manage my injuries to the best of my abilities. Q: How did you prepare for the finals against Mini? A: Mini likes to harass a lot. To counter his style, I used wraiths to shut down his shuttle play. Wraiths are better than turrets against such a style because you can scout on top of being able to defend against Mini's shuttle play. Q: So was it your plan to overpower him after shutting down his harassment style? A: Yes. I felt as if I would have the upper hand going into the mid and late game if I didn't fall prey to his shuttle harassment. Q: You repeated your proxy factory strategy versus Rain against Mini as well on Block Chain. A: I used a similar strategy, and I knew that I won once the proxy factory landed successfully. 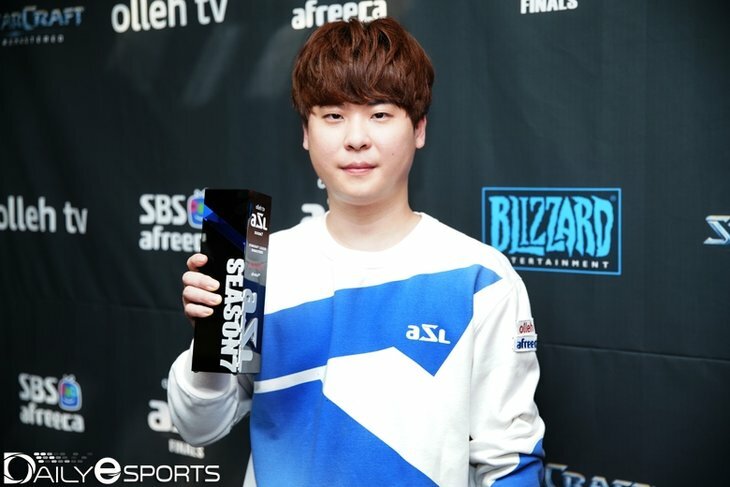 Q: You became the first ever player to win both the KSL and ASL. What's next for Last? A: I enter every tournament with hopes of winning it all. I've heard that I am the first player to become the champion of both the major leagues ever since the era of ASL and KSL began. I hope to give performances worthy of such a title. Q: After defeating Sharp, you mentioned that it is a minimal requirement to win in a tournament without Flash, if you wish to claim to be the second best terran in the world, how do you feel having accomplished that requirement? A: I've been the second best terran around for quite some time (laughs). I'm glad to achieve my minimal requirement of winning a tournament without Flash participating. I will try to catch up to Flash's legacy by entering future tournaments also. Q: Do you think Flash will enter the next ASL? A: He was seeded into this tournament, but didn't enter it due to his wrists hurting. I hope he manages his condition, and compete besides me in the upcoming ASL. Q: Are you willing to share any tips for managing your wrist and arm pain? A: I'm sure Flash knows better than me. He even had surgery to deal with his pain way back in the days. A: I know a lot of fans had been worried about my worsening arm pain. I think I won due to their support. Thank you all for your support. Thank you (letmelose) so much for the translation. Honestly I think he should take the JD/Flash route and take a season off if his pain is as bad as it sounds...he's already won the championship, there's no need to jeopardize the rest of his career for just one season. Grats to Last. Hope his wrists get better. Thanks for the translation, congrats to Last! I would have raged really hard if I had Wraiths denying my Shuttle harass. It’s cool the pros come up with strategies like this. Damn, I hope he takes some time to let his arm/wrist heal now that he’s gotten the double championship. I wonder what they gave him for the pain, hopefully if it’s opiates or something like that he will only be on a short course. In any case, thanks for the translation and big congratulations to Last for the win. This was a fantastic season of ASL, especially the RO4. Last is a monster at this point, if he can somehow deal with his injuries I’m sure this is only the start of a very long period of success. When is the next BW tournament? I'm a bit sad that Mini lost, but also happy that Last won because with his wrists, there's no telling when he'll get a chance to grab an ASL trophy if they start acting up again. Congrats to last. It must be really tough for him to play with the injuries. I enjoyed the games, congratulations Last! Ain't nobody gonna take a quick back nexus anymore haha that BlockChain game was so well executed, especially given that he knew Mini watched his game vs Rain. If i were Last i would take a much deserved rest now. I really hope his wrists get better.